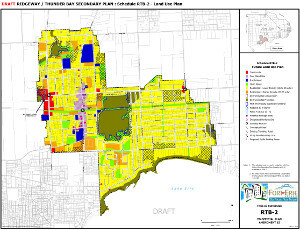 The formal steps are being taken to have Town Council consider adopting the Ridgeway-Thunder Bay Secondary Plan. The Plan essentially illustrates and outlines how and where growth/ development should occur within the community in the coming years. It serves to guide Council on development decisions when someone is proposing to develop or redevelop land in the Ridgeway-Thunder Bay neighbourhood. If Council adopts this Plan, it still needs to gain approval from the Region of Niagara. I would like a list of the people that would Benefit directly from this secondary plan IF it ever received passage by the Niagara regional board…..Thanks! Oh and also…why is the town sending a 14,000 dollar Tax bill to The Fort Erie Underwater recovery unit when it’s a Tax exempt organization? Thanks!! In response to the first part of your inquiry, I submit that should Council adopt the Secondary Plan, and should the Region approve it, those benefiting directly are those person/stakeholders within the Secondary Plans coverage. When considering the Secondary Plan would become part of the Official Plan, it is hard not to acknowledge that the entire Town benefits in some fashion. – Youth with respect to housing that will enable them to find affordable accommodation within the community, hopefully leading to their retention in the community. – There are no single intended benefactors. The Plan is structured with community at its core and seeks to act in the best interest of the public at large. I hope this response has helped you understand the context in which the Plan is intended and that setting a long term goal that meets with public, agency and council approval is in the best interests of all Fort Erie citizens. Respecting the second part of your question, I am unable to provide you with details on that. I would suggest your inquiry on that aspect be directed to the finance department of the Town.